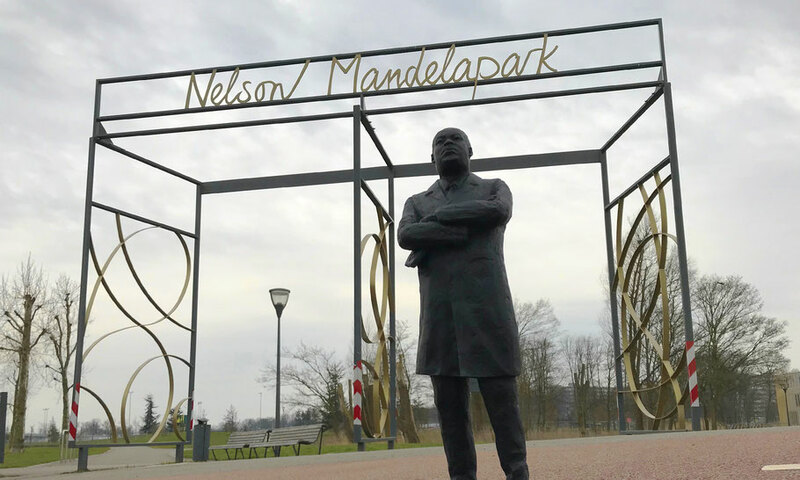 Bijlmerpark in Amsterdam South-East was renamed in 2014 in honor of Nelson Mandela, who died in december 2013, at the age of 95. The park was built in 1969, and renewed from 2009-2011, after a design of architect Francine Houben. In the large 43 hectare (106 acres) park contains sport facilities, ponds, a watchtower, butterfly hill and a magnolia valley. Seven artworks can be found in the park and there will be a Nelson Mandela statue in the near future. Nelson Mandela is often cited alongside Martin Luther King and Mahatma Gandhi as one of the 20th century's exemplary anti-racist and anti-colonial leaders. Although Gandhi had racist ideas about Africans. The small Martin Luther King statue stands proud in this park.